I saw this meme on my facebook, couldn’t find it again, so recreated it myself. If you have children, or listen to the radio for any other reason, then you’ll find this a lot funnier. and the canon explanation is apparently that both Lando and Han are from Corellia, where they always dress like that. There was also a little problem with the cast members at this time. While Mark Hamill & Carrie Fisher had signed to do 3 movies Harrison Ford was only signed to do 2 movies. Ford had made it known to Lucas that he thought the character should die while in Carbon Freeze because thought it would be the perfect ending for the lovable rogue … to go out saving Leia’s life. That might have been why Lucas “dressed” Lando that way … as a transition to him being the “lovable rogue” after Han’s death. 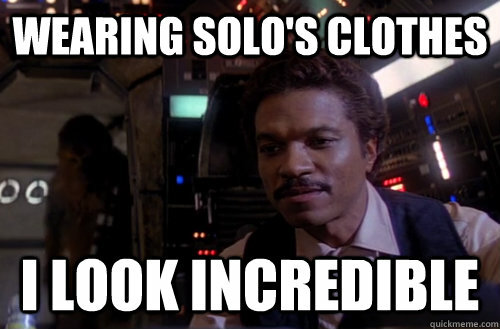 It took a while but Lucas eventually Lucas convinced Ford to do the third movie making Lando wearing Hans clothes a non issue. I can’t claim to be a big fan of Lady Gaga, especially since her new hit single Born This Way is a straight rip-off of the far more talented Madonna’s Express Yourself. In fact, you’d probably have to bribe me to listen to Lady Gaga. With, say, 20 GB of disk space on Amazon’s new Cloud Drive service Which, as a matter of fact, is precisely the deal today – for $0.99, you can get the upgrade to 20 GB from Amazon, as long as you download Gaga’s album. This is a good deal despite the forcible auditory abuse, and it ends today, so hurry up! For 99 cents this is a great deal. 20GB on Amazon Cloud Drive is 4x the size of Microsoft’s SkyDrive and 10x more than Dropbox. The service also integrates with Amazon’s new music service so you can access any music you buy from Amazon on any device, immediately without re-uploading. This is just really, really cool â€“ the crew of Endeavour STS-130 awoke this morning to the Ballad of Serenity. And NASA announced it on Twitter â€“ and is even hosting the mp3 for download. Though you can also get it from the Firefly Wiki. Now, these bring back some memories! I’m not sure when i discovered The Princess Bride, but by the time I got to college I was badly addicted to the movie, and delighted to find a bunch of close friends who were just as insane about it as I was (and pretty much everything else I was insane about, for that matter). This was back in the day when a VCR that was both Hi-Fi and stereo (and 4 heads, to boot) was considered bleeding edge. As it happened, I managed to snag such a godbox for within a college students’ budget and decided to record for posterity my favorite quotes from the movie from my (already) aging VHS copy. These were recorded using an analog mike next to the output speaker of my television; I think I may have also been using an abacus to keep time, though I can’t be sure, as that giant black monolith was really distracting. At any rate, these WAV files, named under DOS eight-character limits, lived on my 386 PC and then migrated to my 486 as various system sounds for my amusement for a few years, after which they ended up in a folder somewhere that then got passed from system to system like a set of junk DNA, lost in arcane hierarchies of old data. I was motivated to dig these out of the primordial digital slime this evening seeing @musabb live-tweet the Princess Bride as a fresh initiate to its mysteries, and decided that they were too good not to inflict upon everyone else. So, enjoy – and please copy them locally for your own use rather than hitting my host with direct links, so I can afford to send my kids to college someday instead of paying bandwidth overages. Incidentally – the audio soundtrack to the movie is probably one of my top five CDs of all time (though I have to count the collected H2G2 radio series discs as one to make it fit). 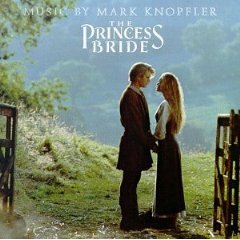 If you are a fan of this movie, and/or of Mark Knopfler, this is essential music. I love this song, almost purely for the sublime musical pun. It’s amazing how much of Sesame Street is written with the poor suffering parents in mind. I am weighted towards recent songs, mainly because I only really got back into music this past year. I still rarely listen to music, mainly just in teh car, and since moving to Marshfield I don’t do that much daily driving. I am supposed to tag others with this meme, but I’d rather just invite anyone to list their seven in comments. UPDATE: Don and Mark chime in – and since Friday was List Day, Mark’s doing a Heist Movie theme, too. Don thoughtfully provided MP3s, shaming me, as I was originally gonna put YouTube links in, but I got lazy.